U.S. 80 splits from the Interstate 20 corridor at Cuba and travels over central Alabama east to Demopolis, Montgomery and Phenix City. All of the route between Cuba and Montgomery is four laned, with the exception through Uniontown in Perry County and along a portion of the Selma bypass. U.S. 80 Business follows the old alignment through Selma, including the Edmund Pettus Bridge over the Alabama River. 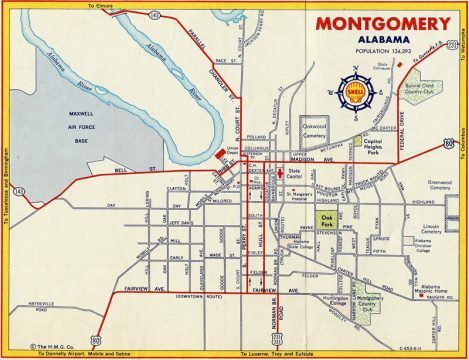 Through Montgomery, U.S. 80 joins Interstate 65 from a short freeway connector east of Montgomery Regional Airport (MHM) and U.S. 31 (Mobile Highway). Approved by AASHTO on June 13, 1992, the overlap takes U.S. 80 north to South Boulevard, an arterial belt route around the south side of Montgomery. U.S. 82 accompanies U.S. 80 to East Boulevard, where it splits to the southeast as U.S. 231 north merges with U.S. 80 east. Prior to fall 2011, U.S. 80 extended north along East Boulevard to Atlanta Highway, where it rejoined its original route through Montgomery east to Mt. Meigs. The route was realigned at that time to overlap with Interstate 86 east from Exits 6 to 16. Alabama 126 overlays a portion of the old route. 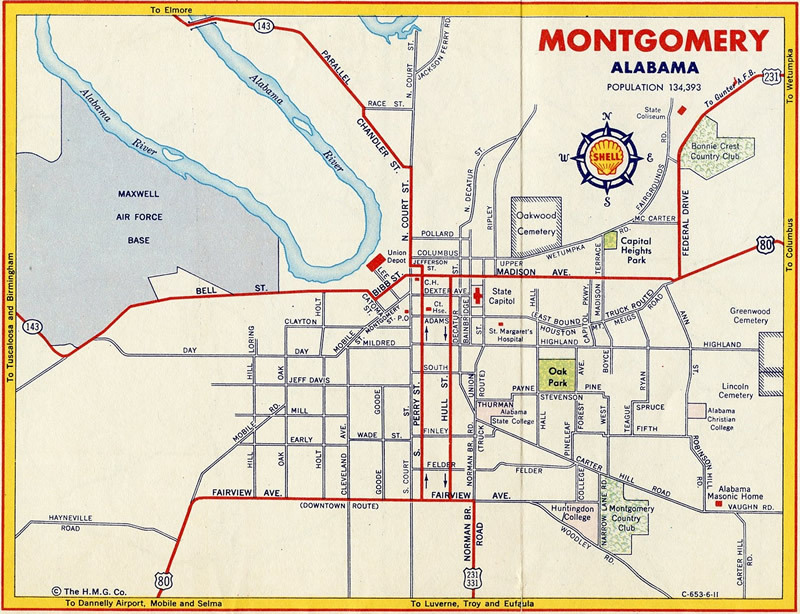 Until the mid 1980s, U.S. 80, along with U.S. 82, 231 and 331 converged in Downtown Montgomery. U.S. 80, 82 and 231 were subsequently realigned onto the arterial belt loop of North, East and South Boulevards, while U.S. 331 was truncated southward. U.S. 80 and Interstate 85 parallel each other east to Shorter and Tuskegee, where U.S. 29 ties in from the south. U.S. 29 part ways with U.S. 80 to accompany the I-85 corridor northeast to Auburn, Opelika and Atlanta while U.S. 80 diverges to the south along a rural, two-lane highway to Ladonia, and a five-lane boulevard east into Phenix City. Turning north with U.S. 280, U.S. 80 shifts onto a freeway bypass across the north side of Phenix City into Columbus, Georgia.